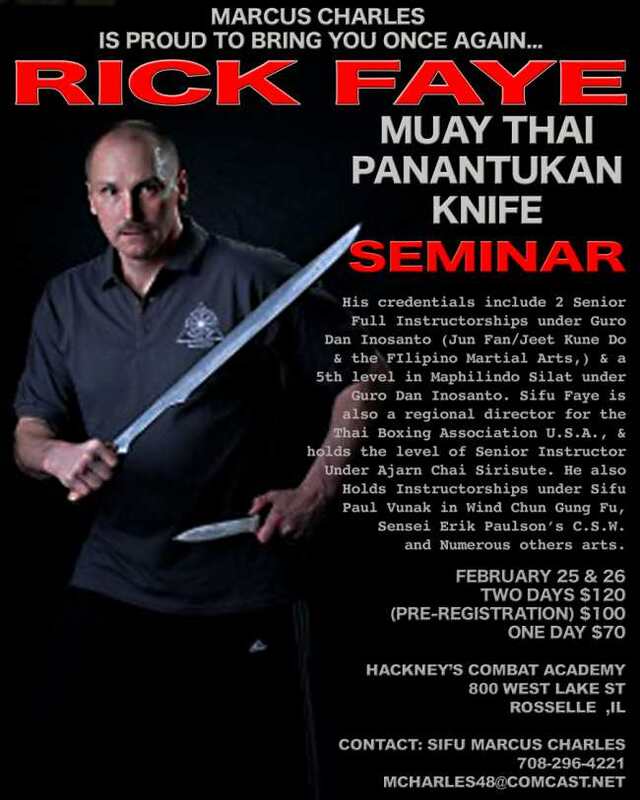 Sifu Marcus Charles, the longtime JKD/Kali instructor who has trained under Tom Cruse, Paul Vunak and Erik Paulson, is happy to announce that he is bringing one of his other instructors back to Chicago for another seminar — Jeet Kune Do/Filipino Martial Arts expert Rick Faye. Faye coached noted MMA trainers Greg Nelson and Erik Paulson early in their careers, and he will be at Hackney’s Combat in Roselle for a two-day seminar on February 25 & 26. Charles is the lead JKD/Kali instructor at Hackney’s. Registration information is on the poster below. We caught up with Rick last time he was here in Chicago, and you can check out LJ Tabano’s interview with Rick Faye.